In traditional budgeting environments planning demand and thus revenues, has typically been a semi manual process. For example, an insurance company might model premium income by starting with policies currently in force, estimating attrition rates, forecasting new policies due to marketing efforts, and adding in the impact of increased or decreased premiums, in order to come up with projected policy volumes and premium income. This process relies upon the subjective judgment of someone who is reasonably expert in the particular insurance market. Another example might be a retailer where a purchasing managers estimates demand volume at a product group/distribution center level. This demand plan must then be pushed down to a store/SKU level by some mechanism for consumption by inventory man agement systems. The disadvantages of these manual forecasting techniques are significant. Manual estimation of demand at this granular level is error prone and laborious. Even though, in the insurance example quoted above, an underwriter might use historical attrition percentages and other historical data to help project volumes, there remains a significant degree of human judgment in the process. In the case of the retailer, ideally the planner would estimate demand volumes at the store/SKU level, but in practice the amount of effort required for manual forecasting makes this impractical. The better approach is to predict demand using a data driven approach. This technique, called predictive analytics, is gaining popularity. In the case of retail demand, historical data can be analyzed to detect seasonal patterns, product lifecycles and the effect of causal variables such as weather, promotions, pricing, etc. Modern software makes what would have been an impossible task a few years ago into an exercise that anybody can do with the right software. If we combine this predictive analytics capability with a financial modeling tool it becomes possible to predict demand and model a full profit and loss account, balance sheet and cash flow. Imagine a world where the retail demand planner can increase marketing spend in a region while lowering some prices and immediately see the impact on demand as well as the impact on the bottom line. IBM SPSS modeler is a predictive modeling tool which integrates with IBM Cognos TM1. 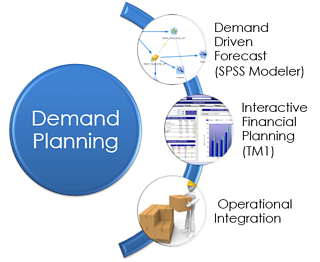 The integration between these two tools allows demand planning and financial modeling, all in one single environment. Want to learn more about how QueBIT’s integrated Demand Planning solution maximizes revenues through forecast accuracy while controlling costs. Contact our team to learn more!